Located at the tippy top of British Columbia's Queen Charlotte Islands, Langara Island is one of the three premier remote fly-in saltwater fishing locations - along with Rivers Inlet and Hakai Pass - in British Columbia. Reached by resort-chartered plane from Vancouver's South Terminal, Sandspit is the gateway for a short float plane trip to some of the best salmon fishing in the world; a 72 pound chinook topped the leader board in 1997. 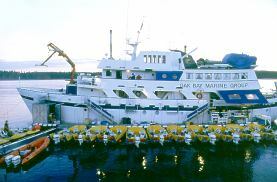 Photo: Oak Bay Marine Group Lodge at Langara Island. Winter fishing is influenced by remoteness of location. A potent winter feeding ground for swarming stocks of chunky winter feeder chinook salmon, Langara resorts, much to the chagrin of fishing addicts, operate only in summer. Summer fishing is influenced by remoteness of location (This is as remote as it gets.). Langara Island is the first offshore landfall for salmon migrating toward natal streams, for example, Fraser River sockeye, which can number 15,000,000 in a good year. Due to slight angling pressure 8 months of the year, trophy-sized bottom fish mill the marine markers in trophy numbers - lingcod , halibut , red snapper, 37 species of rockfish. Be prepared for fish-till-you-drop angling, luxury accommodation and more bald eagles and dolphins than you will ever see again. All five species of salmon may be found around Langara Island: chinook , coho , sockeye, chum and pink . All species are migratory fish, appearing as mature animals in summer and early fall, finning relentlessly to spawning beds. Langara is one of the very few areas where all five species may be found on the fishing grounds for most of the summer. May 15 to June 15, lively 18 - 22 pound feeder and early migratory chinook form the basis of the catch. Large 30 - 50 pound chinook mingle with these fish and may be caught throughout the summer until September when lodges close. Coho first show as 9 - 10 pound fish at the end of June. During the July - September period, successive runs pour around Langara shores and size increases to 15 - 20 pounds. Chum, absolutely bright chrome and almost indistinguishable from coho, also appear at the end of June, and may be taken throughout the summer. Make sure to check for a long jaw and distinctive tail. Any salmon with purple and yellow bars will be a chum. These 10 - 15 pound fish make for extreme sport, having the fighting capabilities of large chinook and coho combined. Small and feisty, 4 - 8 pound pink salmon, make the most eager salmon in the sea during the July - September period. Unlike southern areas which receive runs every second year, Langara pink whistle through every summer. Fraser River runs average 10 - 15 million pinks every odd-numbered year. Sockeye salmon peak in June and July. Although there are other runs, Fraser River sockeye have a date with a river 500 miles to the south. Bait: Since all gear must be brought in by plane, all area resorts use and supply cutplug herring for salmon fishing. The Langara spiral is medium speed and 4" in diameter. Accordingly, slice large herring behind the gill plates on a double 45 degree slant (ie., 45 degrees from dorsal to ventral surface, as well as 45 degrees from lateral to lateral surface). Utilize a double sliding hook (4/0 - 5/0) arrangement on a 6' leader to a 4 - 6 oz banana or popcorn weight. The fishy depth is 13 - 25 pulls. In deeper water off Lacy Island, 80 pulls finds the deeper fish. Fish bottom fish with whole herring rigged as above (hooks as large as 9/0). Attach leader to a 1 pound cannonball and make sure your stout rod sports spider wire above the ball. Hootchies: Not commonly used, however, the Army Truck pattern should do the trick for chinook and the Bubblegum should tantalize other species. Langara Island has two types of fisheries: surface fishing for all five species of salmon; and, structure-related fishing for bottom fish. This is an area of astonishing abundancy and a quick summary of hotspots is difficult. While salmon fishing can be excellent off many southern and eastern points, the best bets are either Gunia Point or Cohoe Point. Usually, if the fish are not at one spot, they will be at the other. Fish relatively close in following land contours. Gunia Point has good fish-bearing structure in 50 - 75' water on ledges from Douglas and Coneehaw Rocks down along the main shore to the entrance of Pillar Bay. Read fish on the depthsounder and fish methodically. Further up the Queen Charlotte Island shore, almost directly across from the Charlotte Princess mooring spot, Marchand Reef produces more 50 - 60 pound chinook than any other local spot. Cohoe Point offers good protected fishing on days when the prevailing wind blows in from the Pacific Ocean in a westerly direction. Particularly strong coho, pink and chum fishing can be had by working the shoreline then proceeding offshore for up to � a mile and then returning for a trip through Dibrell Bay. Tidal flow moves all species of salmon here and consideration of its effects will influence success. The north side of Andrews Point normally has a huge school of black bass providing an excellent non-stop flyfishing opportunity. Many chinook over 50 pounds are registered in the choke point between shore and shoals some few hundred yards offshore. Rocky northern bays near St. Margaret Point hold lingcod to 40 pounds as do reefs near Lacy Island and Ocean Shoals. Red snapper to 20 pounds swarm rockpiles off Lacy Island and further out, at the 250' level, reside extremely healthy numbers of halibut. The 200 - 250' flats off Cohoe Point present a second halibut option on windy days. Having said this, I have witnessed a battle with a 200 lb halibut right off the lodge float, so the big mamas may be found in several locales.